The ishapes example is a visual example to show DDS in action. 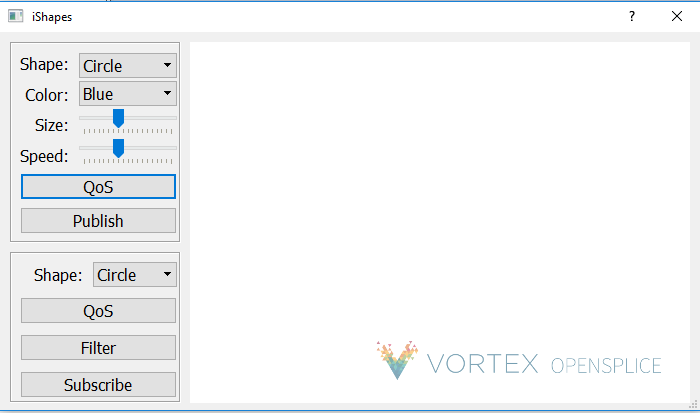 Vortex OpenSplice publishes and subscribes to different coloured shapes seen on the screen. What does the ishapes example show? Where do I find the ishapes example? The ishapes example is a visual example showing DDS in action. It allows you to create a writer which will write different instances of various shapes. These can be circles, squares or triangles and they can have different colours. The writer writes the shapes and they appear moving on the screen. You can then create a reader to read different types of shapes. These change colour to show they have been read. 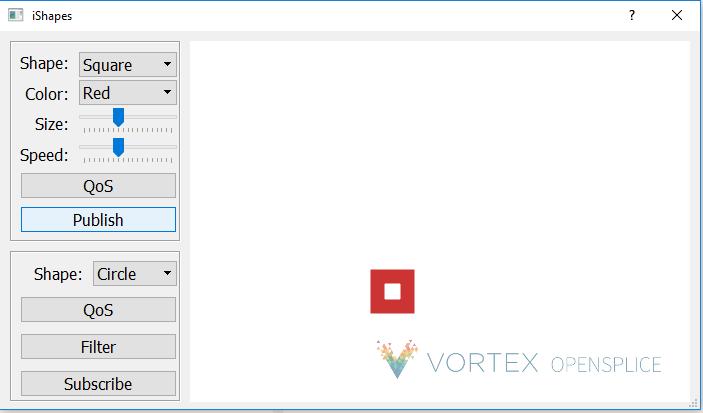 The ishapes example can be found in the demos/ishapes directory in the Vortex OpenSplice installation. The example is prebuilt and you should be able to run it without compiling. The example comes with source code case you wish to build the example yourself. There is a readme file in this directory which takes you though the steps to rebuild the example. The QT4 versions are in the download archives. Before running the example you need to ensure that the QT libraries are on your PATH. These are in the bin directory of the QT installation. On some operating systems these will be on the PATH by default. Go to the tools section of the launcher and start a console. The example window should appear. From the launcher start another console window and run the command: demo_ishapes.exe again. You should now have two example windows. We can use one window to publish some shapes and the other window to read these shapes. You can publish shapes using the top right hand side box. 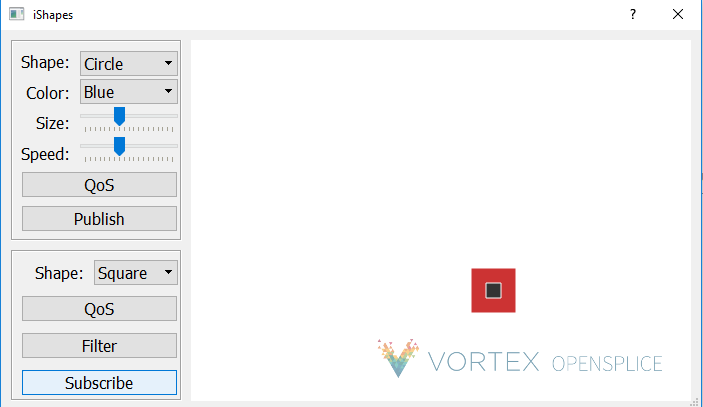 The drop down menu next to shape lets you choose to publish a circle, square or triangle. The drop down box next to colour lets you choose the colour you want the shape to be. The size slider will make the shapes bigger or smaller. The speed button will make the shapes move faster or slower. The QoS button will allow you to choose the QoS properties you want the shape to have. Once you are happy with these settings click publish and you should see the shape moving in the window. In this picture I have chosen to publish red squares. To subscribe to shape use the subscribe box on the bottom right of the example window. Choose the shape you want to subscribe to and click subscribe. When a shape has been published you will see it in the reader window with a black dot in the centre to signify that it has been read. This picture shows that the red square published previously has been read. 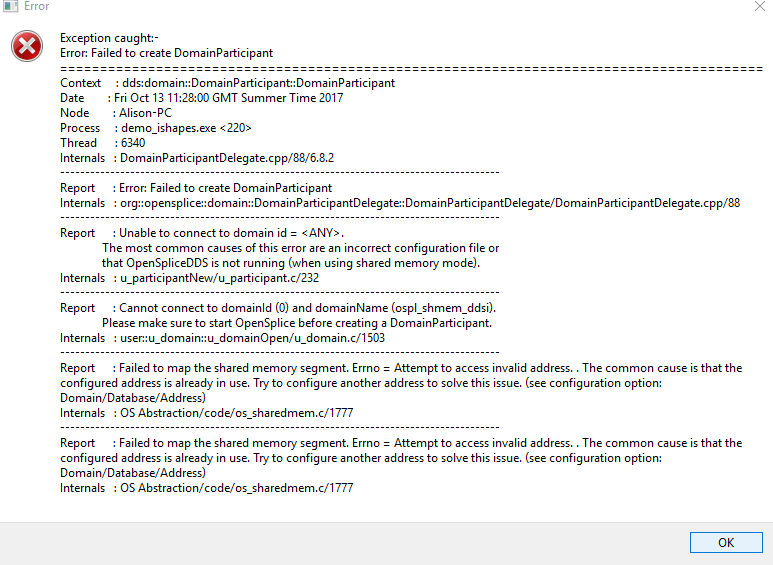 If you are using shared memory configuration check that you have started the OpenSplice deamon. You can do this using the command: ospl status. 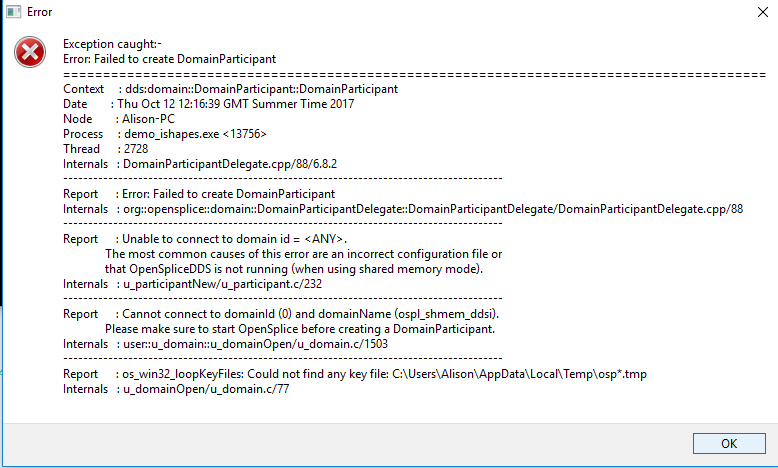 This error is normally seen when the OpenSplice deamon is not running. Start the deamon then try running ishapes again. Occasionally you may see errors that say “Failed to map the shared memory segment” even though the Vortex OpenSplice deamon is running. To get round this you need to change the memory address where the OpenSplice deamon starts. This can be done using the OpenSplice configuration tool.